Tonight my friend Kari came over for dinner. She is my tech-yoda, and we have a great system set up where I feed her and she helps me stay up with the latest and greatest in technology. 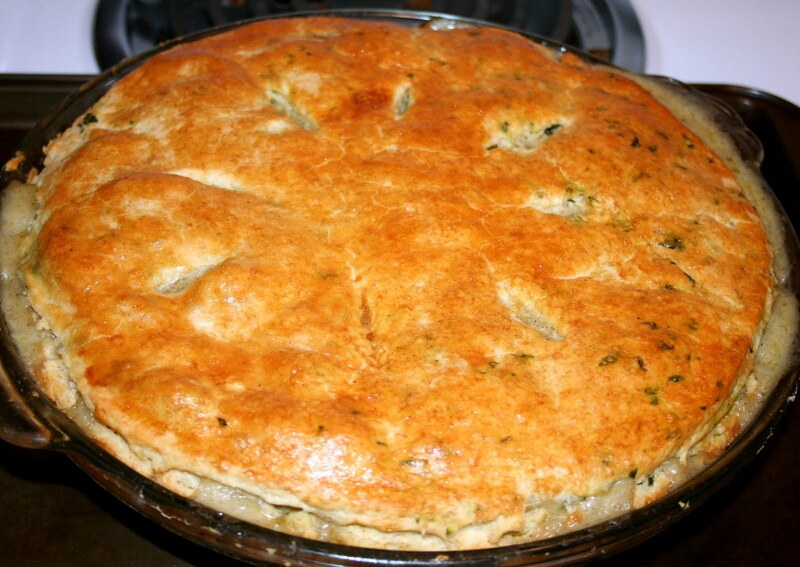 I decided to make chicken pot pie tonight, because I saw a really cool looking pastry crust recipe I wanted to try, and chicken pot pie is one of the best crust-related dishes I know. I found the crust recipe at Closet Cooking. Here's a link to the recipe. I followed the instructions exactly, and it came out beautifully. For the filling, I totally winged it. It was one of those ice box cleaner-outer kinda things. I started by poaching 6 boneless, skinless chicken thighs in white wine, chicken stock and water. I strained the broth out and saved it to make the sauce. I put the chicken on a plate in the ice box to cool so I could chop it. I used the same pot and heated a few tablespoons of olive oil. I dropped half a chopped white onion, some diced carrot, and some diced new potatoes in. I seasoned with salt and freshly ground black pepper, as well as a pinch of poultry seasoning. After about 10 minutes, I added 2 tablespoons of butter and let it melt. Then I stirred in about 3 tablespoons of all purpose flour. I let that cook a few minutes and added about a cup and a half of the chicken broth I saved from poaching the meat. I stirred constantly and brought it up to a bubble. It thickened nicely. Next I added about half a bag of frozen peas, about 1/2 a cup of heavy cream, and tasted to adjust the seasoning. By this time the sauce was really thick. I took the chicken out of the ice box and cut it in a rough dice. I stirred it into the sauce. The pastry recipe made 2 crusts, so I put the first in the bottom of my pyrex pie dish. I filled it with the chicken mixture, and put the other crust on top. I cut some vents in it, painted some egg wash on it, stuck it on a cookie sheet, and baked it at 375 for about 30 or 40 minutes. Although it didn't come out of the pie dish in one piece, it was delicious!